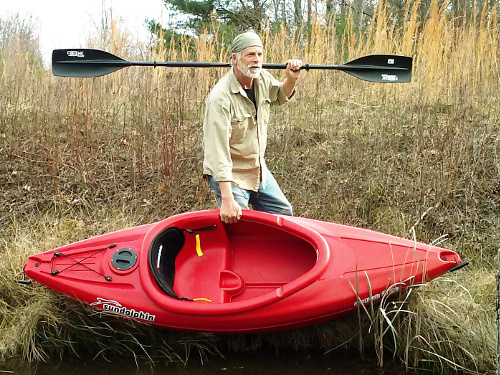 I am fortunate to have access to a private acre-sized pond where I enjoyed storing and using a fifteen and a half foot Mackinaw canoe. Many hours were spent on the water enjoying the surrounding woods while fishing along with family and friends. It held three adults and fishing gear. I have also taken it to a local reservoir and was able to explore various inlets and areas only accessible by boat. It was basically a two-man operation to load it up for transport. 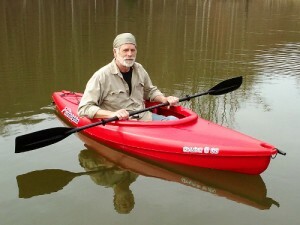 I learned how to do the “J” stroke with the single paddle and could maneuver quite well. For ten years I stored the canoe by the remote pond when one day I arrived to find it missing and was quite forlorn. Now that nearly a year has passed I decided to acquire a kayak which opens a new chapter in life for learning and experience. 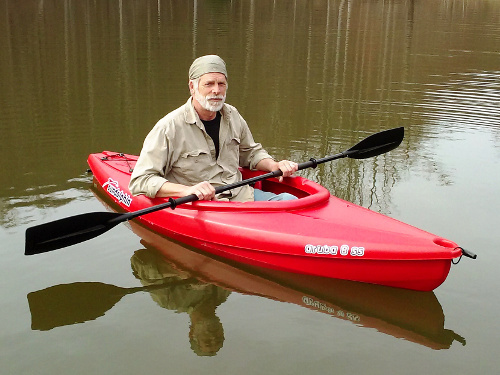 This is an eight foot entry level kayak in a market that offers differing purposes, qualities, and price ranges. On my inaugural voyage I noticed some significant differences: I sat straight-legged, it had a smaller draft line with less stability, gear space was limited, it used a dual paddle whose technique differed than a single paddle, it carried a single person, and it was light enough to carry in one hand. It weighs only 27 lbs. and I can easily load it by myself for transport which enables me to store it safely at home. Initially I tried to apply my canoe paddling techniques to the kayak but wobbled all over. 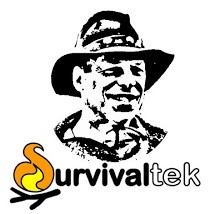 Subsequently a friend has helped me to learn the ways of kayak paddling and had great suggestions for various accessories to make a more safe and pleasant experience. I realize that the pond is a peaceful environment and someday I may want to graduate to a placid stream or white water river but that will require additional safety gear and training. That endeavor may also lead to a higher grade of kayak but for now I am getting acquainted with the fundamentals and I’m looking forward to making new memories with this versatile and affordable water craft. This entry was tagged Boat, Canoe, Fishing, Kayak, Paddle, Pond, River, Transportation. Bookmark the permalink.